Many people associate the summer months with traveling and fun in the sun. While some people consider their pet a travel companion, other pets may be better left at home. How can you decide the best option for your pet? Dr. Stacy Eckman, clinical assistant professor at the Texas A&M College of Veterinary Medicine & Biomedical Sciences, offered some insight. Boarding kennels—or facilities that house a large number of kennels for dogs and cats to stay in—should be considered a possibility when you decide your furry-friend cannot make the trip with you. Boarding kennels are comprised of various sized kennels. There are typically several kennels in a room, and some may have outdoor access. 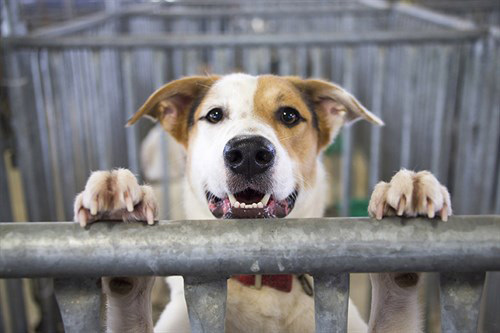 Some kennels are part of a veterinary hospital, while others are simple boarding facilities. Many kennels are built to reduce the noise and visibility of other pets. If you decide to board your pet, what should you look for in a boarding facility? “You should be able to tour the facility before you decide to use their services,” Eckman said. “Some facilities offer outdoor play and exercise time, while some offer individual ‘suites’ for pets that offer more room.” Deciding what environment will be most comfortable will play a major part in deciding the best boarding kennel for your pet. Although boarding kennels can make a great option for when you have to leave your pet behind, there are some potential drawbacks. Your pet may experience stress due to the environment and other pets may expose your pet to health problems. Additionally, if your pet gets sick from car travel and the facility is a long drive from your home, the drive to the boarding center can be a challenge. Although there are some potential drawbacks to boarding facilities, they make a great option when your pet cannot stay in your home or with a sitter. Be sure to choose a clean, safe, and comfortable boarding facility. Most importantly, remember to tour the facility before handing over your pet.